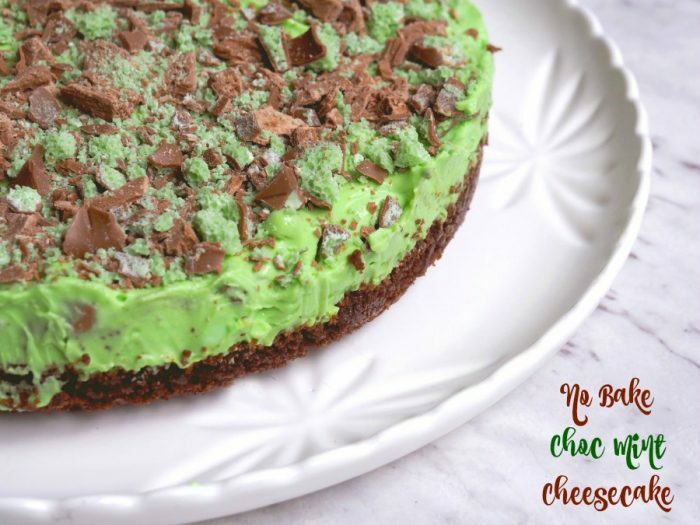 I’ve got a long history making no bake cheesecakes from my favourite chocolate bars. First there was the Kit Kat Cheesecake, then there was the Malteser Cheesecake and the Crunchie Cheesecake completed the chocolate bar no bake cheesecake triology. 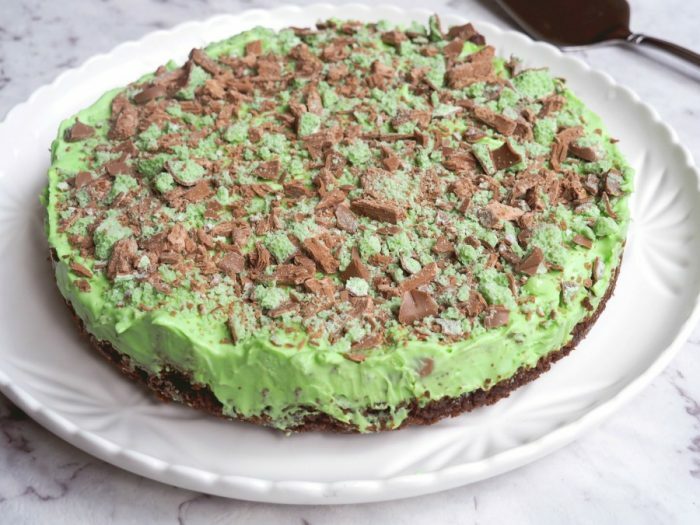 I thought my work was done in the no bake cheesecake department but then Snoskred suggested that a mint choc chip cheesecake would be the business, and she was so right! 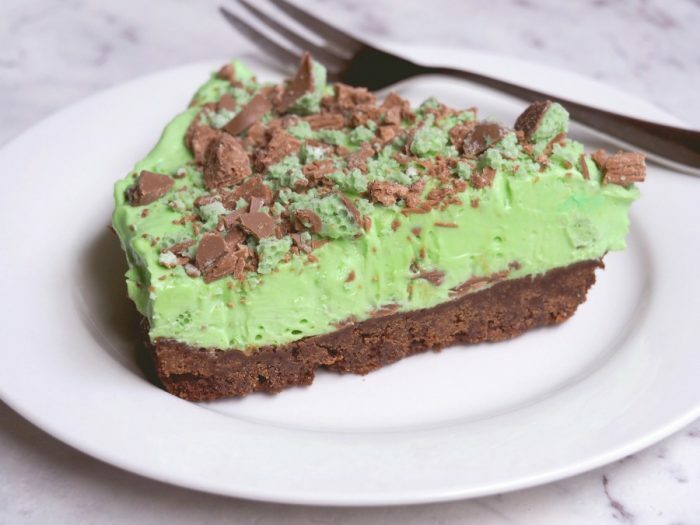 This cheesecake is in fact very forgiving, you can basically add any (and why not every) mint chocolate goody you can get your hands on. This cheesecake is not baked and it doesn’t contain gelatin so it’s texture is almost mousse like, only firmer. I took this round to a mate’s barbecue and it was so good, everyone went back for seconds. 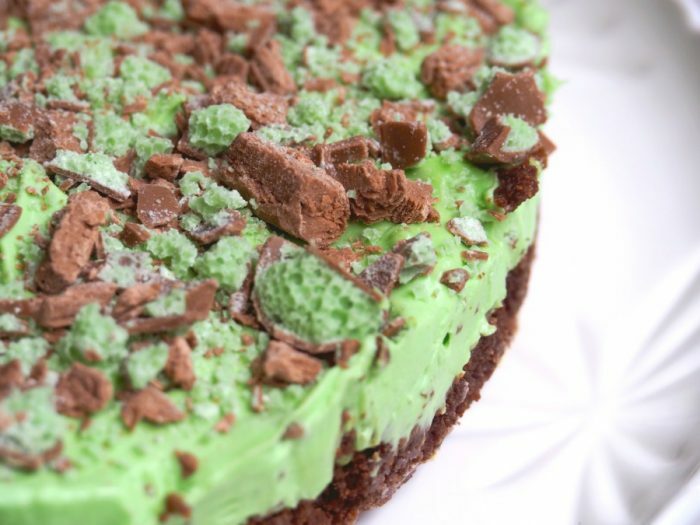 I stocked up on all the mint Aero bars for next time, because this cheesecake is such a delight, there will definitely be a next time. 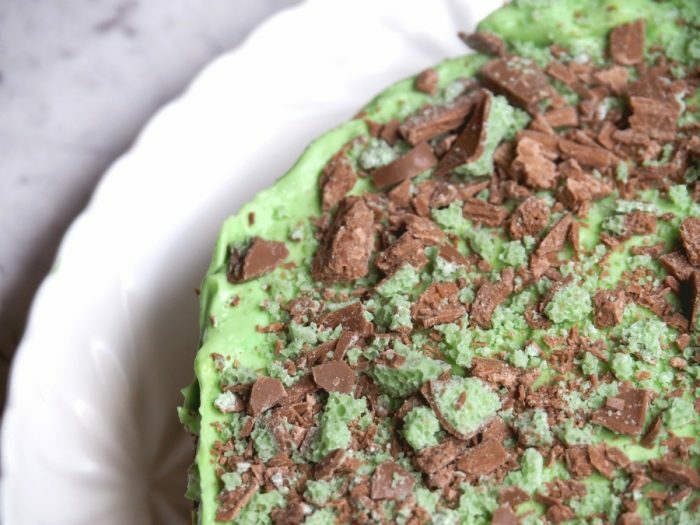 Are you a mint choc chip fan? What’s your favourite chocolate bar? Lightly grease a 20cm springform cake tin and set aside. I like to line the base with baking paper to ensure easy removal. Roughly chop the Aero/Bubbly bar. Set aside. Melt butter in a pan or in the microwave. 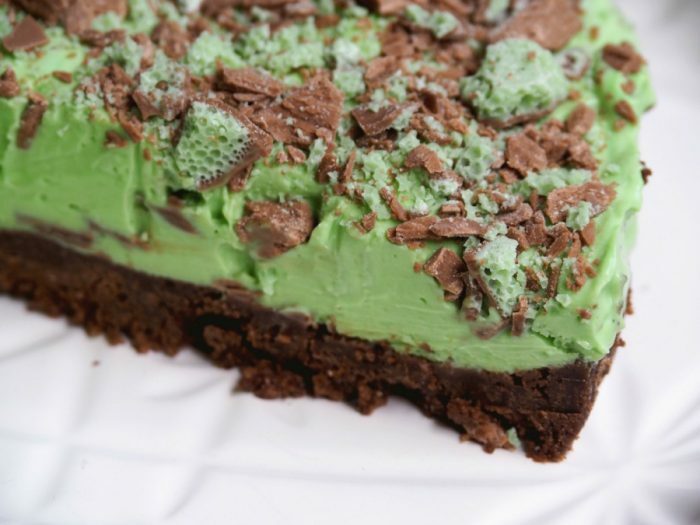 Mix the sugar, cream cheese, cream, food colouring and peppermint extract until smooth and gently fold through the chopped chocolate bar. Pour the mixture over the base and then chill for at least 6 hours, preferably overnight, before serving. Just before serving, scatter the Flake and Aero over the top of the cheesecake. Use a warm knife to cut slices for best results. Place butter into TM bowl. Melt for 3 minutes at 50 degrees on speed 3. 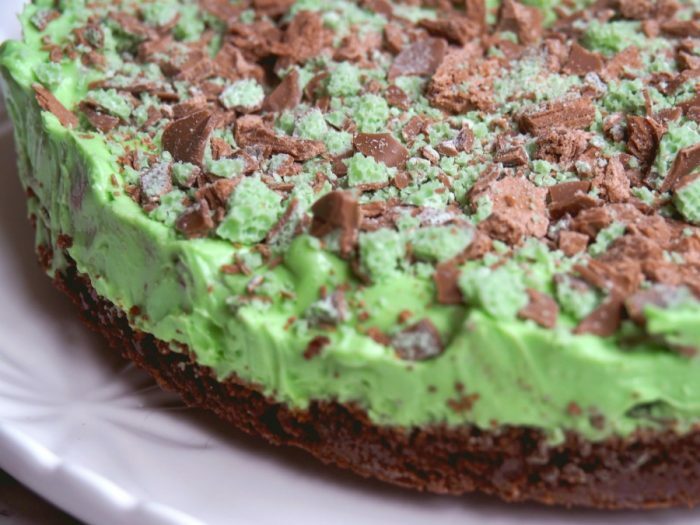 Add the Chocolate Ripple and Mint Slice biscuits to the TM bowl and blitz for 15 seconds on speed 8 until it looks like fine crumbs. Press the biscuit mixture into the cake tin and pop into the fridge to chill while you make the filling. If using raw sugar, put the sugar into TM bowl and mill for 5 seconds on speed 9. Add the cream cheese, cream, food colouring and peppermint and mix for 20 seconds on speed 5 until smooth. Add the chopped chocolate bar to the TM bowl and mix through on reverse speed 2 for 10 seconds. TIP! This works best if the cream cheese is at room temperature.